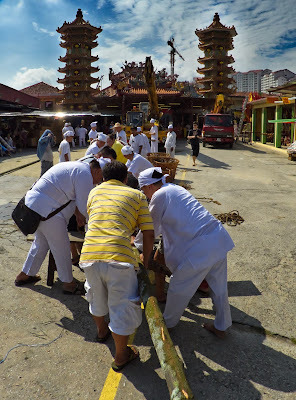 The Nine Emperor Gods Festival kicked off at Ampang with the raising of the lantern pole on Friday (4th October 2013). 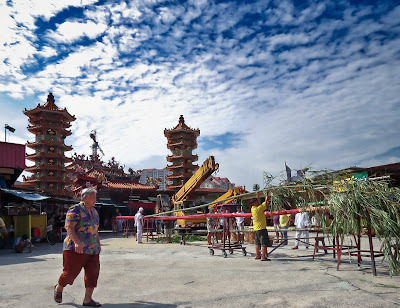 This year, as can be seen from the early preparations by the temple leading to the festival, indicates a very time-conscious organising committee. And indeed, the crane to raise the pole was there by 9.30am and the process was started at 10am. As I am concentrating more on time-lapse and also due to work commitments, there will less photos on the daily updates of the happenings at Ampang Nan Tian Gong. It was a clear and bright day, so the process was expected to be a straightforwards affair. 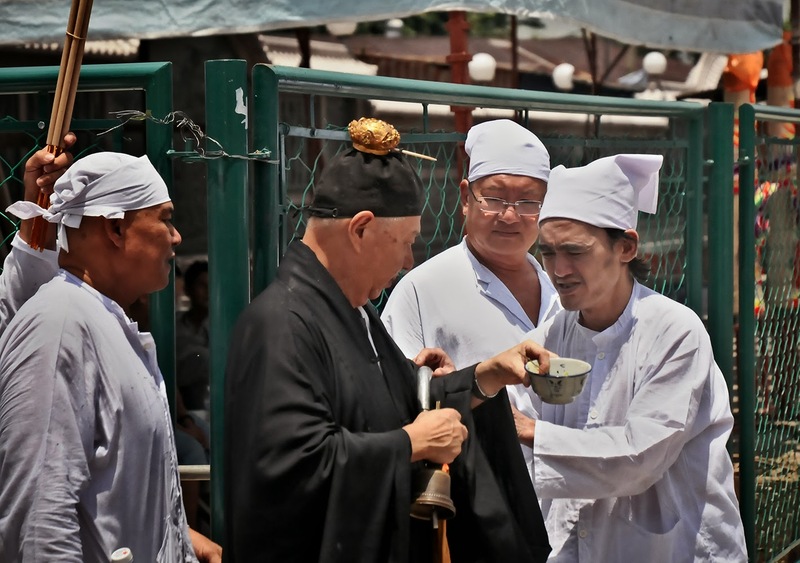 The pole was prepped in the usual manner, and talismans were glued all over the pole. I had set up my tripod and camera to take shots, when I noticed there weren't many photographers. Thinking that it was due to the fact that today was a working day, I din't give it much thought. Getting the pole ready - temple staff aligning the bamboo section of the pole to the lower half. Then as the pole was lashed to the crane and being hoisted up, more and more photographers started streaming in, many of them scrambling to get shots. Ahhh, many were caught as the temple is usually behind schedule in the previous years. Unfortunately for the photographers, they were very punctual and more organised this year. In fact there were more people actually working than people trying to be bosses this time around. Working together to lash the pole together. So up the pole goes, and with the base firmly set in and all that needs to be done was to raise the top section fully, suddenly...a loud crack! 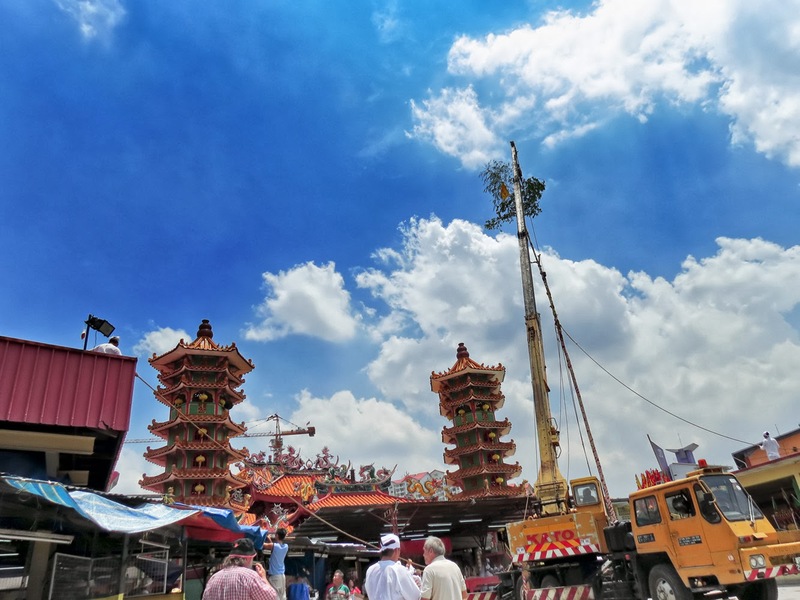 The upper bamboo portion that bears the flag which read Ampang Nan Tian Gong - Nine Emperor Gods were splayed by the cables! This left the flag hanging awkwardly downward. This is the point when the calm and organised-feel of the event went south. 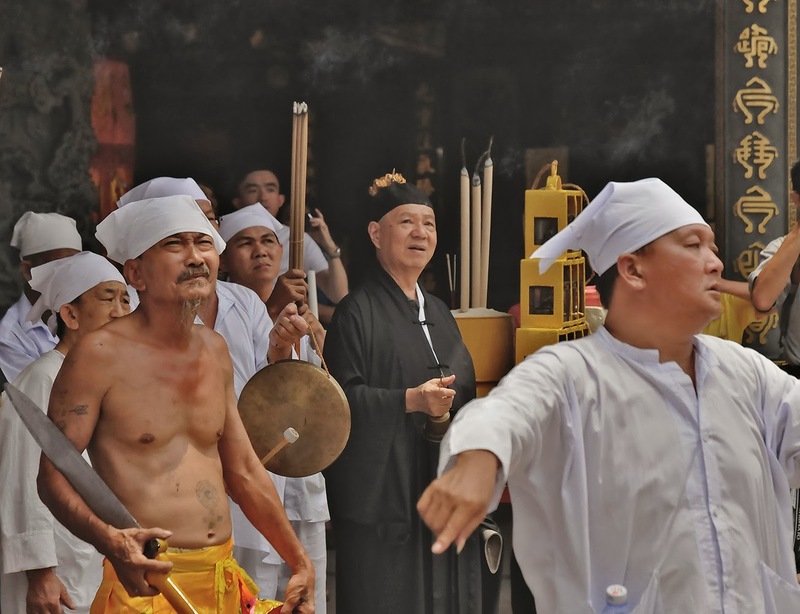 After a little kerfuffle of trying to fix it, it was decided that the Urn Master would ask the deity if the pole should be taken down and repaired. The pole finally up. This was the second attempt after the first round broke the bamboo section of the pole. With a little prayer and a positive toss, the pole was taken off the base and set on its stand again. As if by magic, another fresh bamboo pole appeared. Kudos to the temple team who were very efficient in damage management. This affair of taking down and setting up again was also very welcomed by the photographers as the take two meant that they hadn't missed any photo opportunity this year. Dance of the priest, medium and the assistant - waiting for the pole. Here let me help you - this is the second round of blessing of the pole before it was raised again. Cheryl, Sam and I decided to take a break as it was really hot. After some sawing and hacking and a lot more paper talismans, the pole was ready to be hoisted up again. It was smooth sailing all the way, and everyone, including the photographers were happy at the end despite the ceremony ending late, like it usually does in the past years. Lesson of the day...even if you are punctual and organised, forces up above makes the decision if you actually do end on time. Nature does play a big role in our daily life. Wah nice team work.